Doors and windows are the most obvious entry points for potential burglars, so securing them is crucial to making your home safer. When your doors are already deadbolted and your windows are fitted with locks, there’s no better way to make these entry points more secure than with window and door sensors, which alert you to any unwanted entries into your home. Below we’ve hand-picked some of our favorite door and window sensors so you can better protect your home from the threat of break-ins. For a more comprehensive home security solution, consider installing a home security system. In addition to window and door sensors, home security companies offer additional features like security cameras, professional monitoring, and more. We recommend Frontpoint for its stellar customer service and wide range of home automation. As the first line of defense against break-ins, Frontpoint puts window and door sensors at the forefront of its home security plans. The sensors are portable and easy to install, so you can move them around easily when needed. Frontpoint sensors also integrate wirelessly to your home security control panel. The moment one of your door or window sensors is triggered, an alert is sent to both your control panel and the Frontpoint monitoring center. But they’re not useful just to monitor for break-ins. You can also place them on cabinets and in drawers to keep the kids out of trouble in the house. You can still upgrade your home’s security with self-install door and window sensors without investing in a home security system. In most cases, these devices are interchangeable, meaning one type of sensor should work for the all the doors and windows in your home. Below we offer our top picks for door and window alarms so you can find the right solution for your home. While all the products below are pretty affordable, we focused more on the size, reliability, and available features of the sensors. 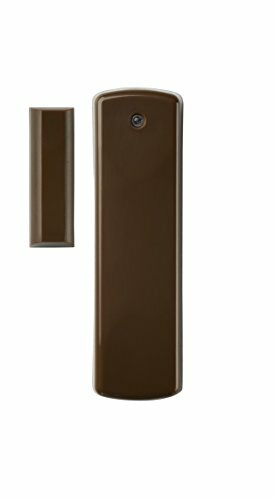 This Doberman window and door alarm works in two modes––a peaceful chime and a powerful alarm. In fact, at 100 decibels, the Doberman’s alarm setting is about as loud as a jet engine during takeoff. That’s enough to scare off any would-be intruders. While these sensors aren’t as aesthetically discreet as some of our other favorites, they’re reliable and less expensive than competing brands. Dimensions: .5 in. x 1.5 in. x 1.25 in. For those seeking a straightforward open/close sensor unencumbered by additional features, the Ecolink Z-Wave Plus is about as reliable as it gets. The sensors are easy to install on your windows and doors, and they integrate easily with Z-Wave home automation products. They also come in white and brown plastic so you can match them with the decor in your home. Dimensions: 3.4 in. x 1 in. x 1 in. This Sabre door and window sensor packs a mighty 120 dB alarm, which is loud enough to wake you from a deep sleep, and probably your neighbors as well. 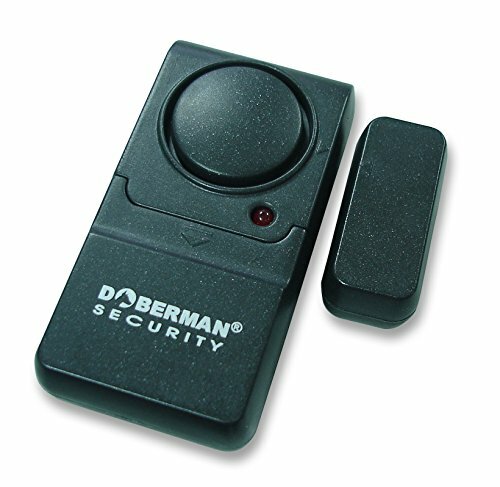 Like the Doberman alarm, it offers a more polite chime mode to monitor family members as they enter and exit the home. 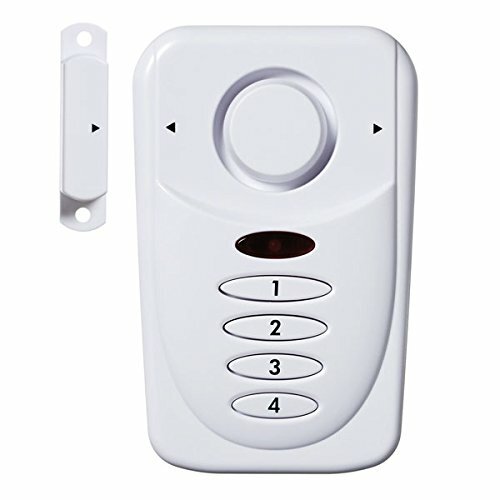 Sabre’s door alarm also comes with a four-digit keypad, which limits the possibility of tampering by a savvy burglar. Dimensions: 3 in. x 1.1 in. x 4 in. If you’re a fan of smart home technology, this is the window/door sensor for you. 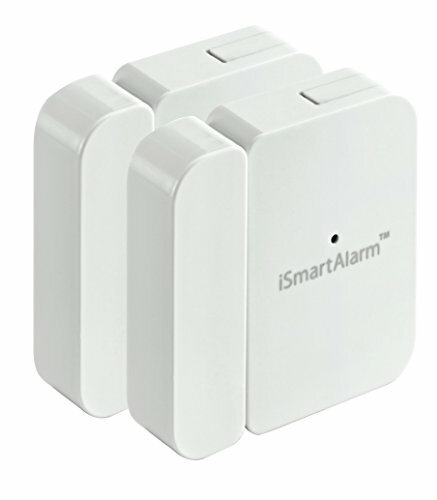 The iSmartAlarm Contact Sensor syncs to a mobile app, where you’ll receive alert notifications and have the ability to customize your sensor settings, including an adjustable alarm delay. The app also gives you the ability to remotely monitor your home for potential break-ins, which can make a long vacation away from home that much more relaxing. Dimensions: 2 in. x 2 in. x .5 in. 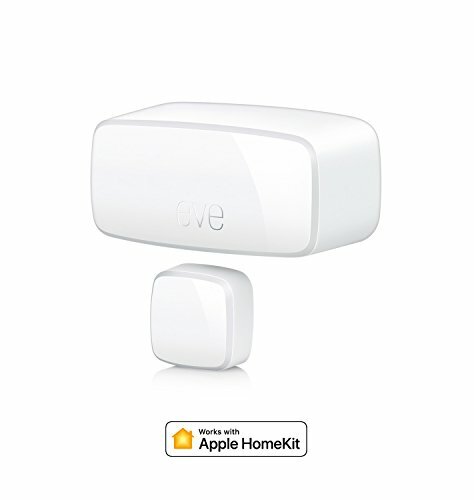 The Elgato Eve door and window sensors work only with Apple products, but we put it on our shortlist because it offers some unique and innovative features. For example, the Eve system keeps detailed records of entry and exit events to help you better understand your home security needs. The sensors themselves are aesthetically pleasing and compact enough to fit well inside any modern home. Dimensions: 2.1 in. x 1.0 in. x 0.9 in. Equipping your home with window and door sensors is one of the most effective steps you can take toward securing your home. But without installing a complete home security system, you can take a few more affordable steps to make your home safer. Try adding security cameras in conjunction with your door and window sensors to get a visual on any potential break-ins. Do you have experience with any of the door and window sensors above? We’d love to hear your thoughts in a comment below. See also: How Do Window Sensors Work?